The Mexican Pharma (themexicanpharma.org) received an F- Rating and a very rare “STAY AWAY!” warning after a long and detailed investigation by the U.S. Watchdogs. Full story: WARNING! “Mexican Pharma” Gets An “F-” Rating: STAY AWAY! The Mexican Pharma recently lost its credit card processor and can no longer accept credit cards. It is now said to use deceptive and misleading trade practices in order to entice potential clients, or we could say “victims”, to pay for their prescription medications by a PayPal “Send Money” or Wells Fargo “eCheck”. These forms of payment are pretty much the same as sending cash through the mail, leaving absolutely no recourse to their clients if there is a problem with, or non-delivery of, their prescription medications. What is particularly troublesome is that many of their U.S. clients are senior citizens, who are the target of many Internet Predators. One such senior reported to the U.S. Watchdogs that after making his eCash payment to The Mexican Pharma, he had not received his heart medications nor any reply from the Mexican Pharma to his emails and phone calls (which did not allow him to leave a voice message). While he did finally receive his heart medications, after being out of them for over a week, and only after the U.S. Watchdogs contacted the Mexican Pharma, he asked that the U.S. Watchdogs do an updated story as the Mexican Pharma (themexicanpharma.org) had told him that the delay in him receiving his medications was caused by the Mexican Postal System. The U.S. Watchdogs reported that while they felt optimistic that The Mexican Pharma was trying to correct its website and policies, they in fact, found out the exact opposite. While the Mexican Pharma wrote the U.S. Watchdogs that they were now accepting credit cards, and had placed a notice of this on their website, it was a bald-faced lie. As any good investigative news site would do, the U.S. Watchdogs verified the facts by having the original complainant order his medications from The Mexican Pharma. Low and behold, The Mexican Pharma was still unable to accept credit cards, the exact opposite of what they stated in their emails and on their website. Note: While no one can say for sure, it does beg the question: did The Mexican Pharma’s former credit card processor drop them, and if so why? And if it was The Mexican Pharmacy that dropped its former credit card processor, why does it not have another one to take its place? It gets worse: When the complainant tried to order his needed heart medications, he found that he had been deleted from The Mexican Pharma Database. While The Mexican Pharma denied deleting his account, the U.S. Watchdogs contacted The Mexican Pharma at least 3 times to re-activate his account. They never did. The question then becomes, at least to the U.S. Watchdogs, whether The Mexican Pharma deleted the complainant for revenge or to keep the U.S. Watchdogs from being able to verify the payment claims made by The Mexican Pharma to unsuspecting clients, many of whom are senior citizens? We join the U.S. Watchdogs with their “F-” rating, and concur that The Mexican Pharma deserves a STAY AWAY! warning. WARNING! “Mexican Pharma” Gets An “F-” Rating: STAY AWAY! 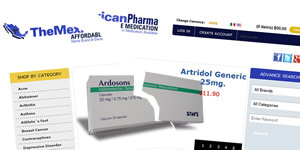 The “Mexican Pharma”: Scamming U.S. Citizens? Has The Mexican Pharma Become A Scam?